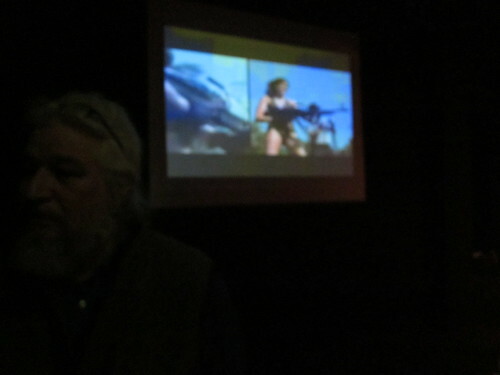 A woman with an automatic rifle was one of the images in a Videofreex screening held in Washington, D.C. in January 2011. Photo by Rhea. I tucked into the book eager to learn more about my father’s life before I existed, hoping to understand more now that he’s gone. I found something unexpected. Video Days chronicles Nancy’s adventures beginning in the era of 30-pound cameras that democratized the art. It continues until 1996, a few years short of the one-handed Flip Cam era. During the social revolution that straddled the late ’60s and early ’70s, the young Nancy runs off to join the New York video-making collective known as the Videofreex. There, she works alongside my dad, Chuck Kennedy. They all live in a rambling former boarding house in Lanesville, N.Y.
Chuck was born in the Bronx and spent a large part of his youth in a Catholic orphanage. At a certain point, he was given the choice between reform school or the Army, so he joined up. In the Army, Chuck learned electronics and saw the world. These lines appeared verbatim from one of Nancy’s journal entries, the very same one she had sent me when I was working on an essay about my father. Then I saw more. The descriptions of people and places, as well as the oddball interview style adopted by the group, also looked familiar. I realized I had seen them before, on the Videofreex YouTube channel and at screenings of their work in New York and Washington, D.C. Nancy had done something rarely seen in our memoir-hungry era. She had used the bedrock of documentation to build a rich personal story. This is not to say that all of the video sparkled gold. Videofreex archives do include an intimate talk with Fred Hampton about the work and future of the Black Panther movement and interviews and recordings of Abbie “Steal this Book” Hoffman. But not all of the videos carry such poignancy. Nancy shares full conversation transcripts even when–or perhaps because–they run in circles. In another passage I recognize, Freex member David Court interviews a woman at the edge of a Vietnam War protest. “The government,” said the woman. “Do you want to stop the war?” David asked. “I can’t stop it all by myself, no sir,” said the woman. “Would I like it stopped? Yes,” she said. The only change here was that Nancy presents the above as a scene on the street, rather than a vignette that made the final cut of a video. In this age of fake memoirists, embellishers, and a break between the camps of stick-to-the-facts-at-all-costs and memory-is-subjective-anyway, I found this refreshing. The closest thing my father had to a colleague had recreated their shared past with purity and honesty. I started to trust even the unfamiliar quotations. I continued to to the end. Decades beyond my father’s departure to join more conventional America, I was still reading.